Thank you very much for agreeing to this interview, Gabriel! Truth be told, Highlander 3 was probably my first exposure to Highlander as a kid probably not very different to your own age at the time it came out (in fact, you and I are the exact same age). Records and IMDB of your body of work and career are a little bit lacking in this regard... how old were you when you were cast and starred in Highlander 3: The Sorceror / Highlander: The Final Dimension? I was 11 yrs old. Beforehand I had played Gavroche on Broadway production of Les Miserables. (Both New York and Canadian Productions). But after Highlander 3 I had to slow down on the acting gigs, i was really falling behind in school, and had decided to go the academic route instead. How did you land the part? Stiff competition? Though you were young, did you have any familiarity with Highlander before taking on the role? If not, did you brush up before it came time to film? I was somewhat familiar with the Highlander movies, but hadn't seen either 1 or 2. 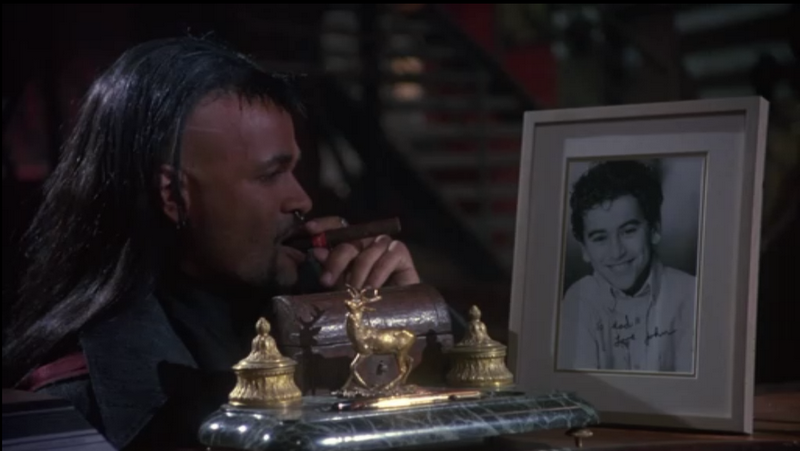 Any particular notable memories from the set working very closely with Christopher Lambert or Mario Van Peebles? The cast and crew? Very cool cast and crew. Mario and I would always be chilling in his trailer - very cool guy. Everyone made me feel very comfortable, being the only kid on set. I do remember tension between Chris and Deborah though. They had a hard time getting along off-camera. But was pretty funny seeing them suddenly play "lovers" on set. Interesting. Do you remember anything of the disagreements/quarrels were between Christopher and Deborah off-camera? haha - no not really - just remember a bit of tension, that's all. Did any John MacLeod scenes end up on the cutting room floor that you can recall from the film vs. the final movie? Yeah we shot some awesome scenes that never made it in the film. One I particularly remember is when Mario's character transforms himself into John MacLeod and Chris and I have an intense fight scene - me charging at him with a knife, and him throwing me across the room. Would have been cool to see in the final cut. When Highlander: Endgame (the fourth film, released in 2000) debuted, did you feel slighted that John MacLeod didn't at least get a mention? No, no. I had ended my acting days by then, so definitely wasn't concerned about my character being recast. Have you kept up with Highlander at all in the many years since the third Highlander movie debuted? The TV series, the subsequent movies, perhaps? Duncan MacLeod and all that stuff? Nope, sorry to say I'm not a big Highlander fan... I just played one! So fill us in on Gabriel Kakon. What have you been doing in the many years since your portrayal of the (adopted) son of Connor MacLeod, and what do you do for a living now? Well, I'm 28 years old now, my acting days are long behind me (they mostly make for great conversation! haha). But I now work as an architect. Doing very well, and very happy. Any interest in returning to the field of acting? No interest really. I had some great experiences working in show business as a kid, met lots of great people, traveled a lot, but I also got to observe others around me, and quickly noticed the harsh realities of life as an actor. Requires lots of patience and sincere passion for performing. How does it feel to, 15 years after the film, still be relevant to the Highlander mythos? It's pretty amazing to hear that Highlander fans are still so into the series and movies after all these years. I'm honored to be part of something so respected and so immortal! That's all I got for you ,Gabriel. Thank you! Great questions Andrew, hope you got some cool insight on it all. I want to find out more about the other lost scenes. What a great interview! No photo stills or scripted scenes or anything that reveals what the final cut would have been like.